VANCOUVER — Members of the Board of County Councilors voted Tuesday to approve changes to the county’s development code which change regulations regarding accessory dwelling units (ADUs) in urban and rural areas. 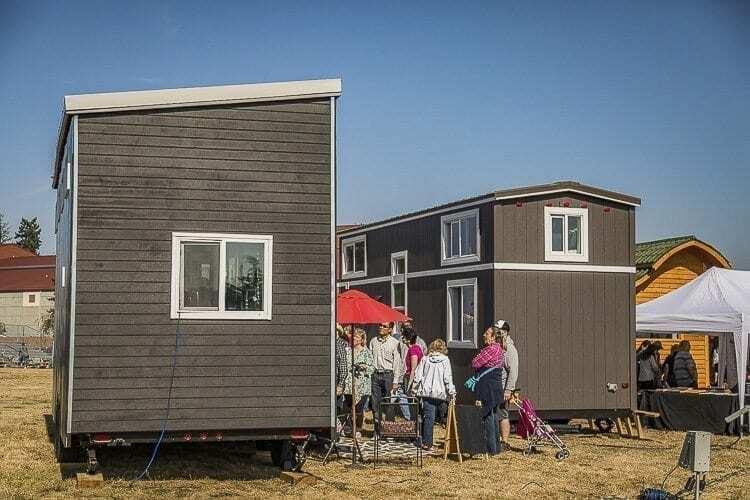 Tuesday’s decision came at the end of the second of two public hearings on the issue, which began at last Tuesday’s meeting but was continued because Council Member John Blom had been in Olympia lobbying for a bill that will allow detached ADUs in rural areas. The current code amendments come after recommendations made by the Planning Commission during its Nov. 16 meeting. The code changes primarily deal with definitions of ADUs. They clarify ADU definitions and provide for new types of ADUs in Clark County. The first change establishes a definition in the development code for tiny homes. Tiny homes are defined as a detached single-family home that is at a minimum 150 square feet, and built on a foundation. Colete Anderson, a planner for Clark County, said that the code changes also create two separate and specific definitions for urban and rural ADUs. The amendments also allowed for the building of attached ADUs, such as in a basement, in rural areas of the county. Cottage housing, which is defined as small homes on separate lots sharing a common green space according to the county website, was also addressed. The minimum size of cottage houses was reduced from 500 square feet to 150 square feet, Anderson said, and the maximum size allowed was increased to 1,600 square feet. Urban accessory dwelling unit regulations were changed to allow for a full basement ADU and establish a minimum size of 150 square feet. A prior restriction to one bedroom was removed, and the requirement for a minimum lot size of 5,000 square feet was also removed. Finally, a new section to the code was added to specifically allow attached ADUs in rural areas. At the planning commission meeting in November, one of the main concerns with reducing restrictions on ADUs was a fear that an increase in ADUs would mark an increase in short-term rentals of ADUs for uses such as Airbnb locations. The planning commission recommended that the code have an owner occupancy requirement, where the property owner lived in one of the units on the property for at least six months in a year while renting the other unit. The original proposal before the council also reduced park and transportation impact fees in urban areas, and transportation fees in rural areas, by 75 percent. School impact fees originally were left at 100 percent, but an amendment to the code changes by the council reduced all impact fees by 75 percent. During the Tue., Jan. 30 council meeting, Anderson addressed several questions which had arisen at the first meeting. She outlined some differences between the county’s ADU code and that of the city of Vancouver, noting that the city does not levy impact fees and that the city has no owner occupancy requirement. Public testimony at both meetings expressed the need for changes to the code amendments before they were approved. At last week’s meeting, Catherine Portlock said that “ADUs are the thing of the future here,” as their purpose is to provide increased flexibility for homeowners and more affordable housing. She said that while examining the code was a necessary action, some of the requirements would be detrimental to ADU development. The main issue was owner occupancy, Portlock said, which in the ADU industry is considered a “poison pill.” Not allowing owners to rent an ADU if they do not occupy a unit on the property for at least six months of the year is an “onerous” requirement, Portlock said. At Tuesday’s meeting, Portlock said she had been corresponding with ADU expert and author Kol Peterson, who noted that under such restrictions, “no one will ever build a permitted ADU.” Portlock re-emphasized that the owner occupancy requirement, as well as the need for on-site parking, was counterintuitive to the development of ADUs in the county. Eric Golemo, of SGA Engineering, said that he was generally in favor of the amendments to the code. However, he also said that the council should remove the owner occupancy requirement from the code changes, as there would be “difficulty enforcing it.” Golemo also said that he supported the notion proposed at earlier meetings that an attached ADU could be considered attached if it was connected by a breezeway. Carol Levanen and Susan Rasmussen both testified, representing the citizens group Clark County Citizens United. Levanen said that if the code changes do not allow for an ADU on a quarter-acre to one-acre lot, “it will be useless.” She said that parents, who may be building ADUs to help house their children, should not have to pay fees or concern themselves with code enforcement to allow their children to live in the basement. Rasmussen said that while ADUs are a “powerful, underused” housing option, the “ordinance needs help.” She said that there should not be any distinction between attached and detached ADUs. Like others, Rasmussen also was in favor of removing the owner occupancy requirement for ADUs. Val Alexander, representing the citizens group Friends of Clark County, provided a statement that expressed support for the code changes but also some concerns. She said that she was not in favor of the increase in maximum size allowances for ADUs, as well as the elimination of the one bedroom limit, as doing so makes ADUs more like standard housing instead of special units. The new maximum size is too big, Alexander said, and in rural areas could place a great burden on septic systems and wells. Derek Huegel, a builder who specializes in ADUs, said that the major challenge to ADU development was owner occupancy requirements. He urged that the council remove the owner occupancy requirement from the code changes. Marnie Allan represented all school districts in the county, and said that the districts do not support removing the impact fees on schools. She said that the districts do not have proof showing how many children are housed in ADUs, but that the impact fees should not be reduced. Council discussion after public testimony largely concerned issues of the owner occupancy requirement and definitions of attached ADUs, especially in rural areas. Jim Muir, community development chief building official, addressed questions about definitions of attached ADUs. He said that to qualify as being attached, the structure attaching two buildings had to be engineered and subject to a structural analysis. Simply constructing a breezeway that is not structurally significant between two units, Muir said, would not qualify as an attached ADU. Blom said that there currently is legislation going through the state legislature that would allow for detached ADUs in rural areas, and he suggested that rather than addressing the question of detached rural ADUs now, the council should wait for the legislation to work through the legislature and then revisit the issue. Blom also proposed that because impact fee reductions are not permanent and can be changed, school impact fees for ADUs, in addition to park and transportation fees, be reduced by 75 percent. Quiring agreed, saying that the county needs more “real information” regarding the impacts of ADUs on local schools before they should be charged the full impact fee rate. Once the ordinance establishing code changes was moved and seconded, the council members proceeded to establish amendments to it. Quiring moved to remove the owner occupancy requirement for both rural and urban ADUs. Blom then moved to reduce all impact fees, including school impact fees, by 75 percent. Stewart said that she would not support the proposed code changes as amended Tuesday morning. According to Stewart, having the owner occupancy requirement “is a must,” and is a “key principle to sustaining the quality of neighborhoods.” She explained that she does not want to see residential neighborhoods turned into large scale rental areas. The ordinance with the council members’ amendments was approved 4-1, with Stewart being the only no vote.